24 7 News Net - The Virgin Mary Sacrifices aka Profile of the DC Sniper! Sollog Names the DC Sniper! If you ever read anything you must read THE VIRGIN MARY SACRIFICES aka A Profile of the DC Sniper. This brilliant work analyzes every shooting location struck so far by the DC Sniper. In A Profile of the DC Sniper Sollog names five more locations the sniper will strike at in order to form a Pentagram over the DC Area! The final hit is a major political figure in the heart of DC warns Sollog. The amazing thing about the Sollog Profile of the sniper is that every location was analyzed by Sollog. HE PROVES EVERY LOCATION has a major religious meaning to the sniper! Sollog also proves the sniper has been giving easy clues to the police as to the next location he will strike at! Here are some examples of the clues the sniper has been leaving behind. When the sniper left the 13th Tarot card at a school named Benjamin that was a major clue. Benjamin was one of the tribes of Israel. The next location the sniper struck at was Manassas. Did you know Manasses was one of the tribes of Israel? Did you know Manasses was the 13th King of Judah, or the same number as the Tarot card the sniper left behind? Does that sound like some uneducated spree killer to you that plays video games? NO, it sounds like Sollog is right, it is an older person with a deep knowledge of the bible, perhaps even a priest or minister! Sollog says the age range of the sniper should be 47 to 57 and the shooter was probably trained as a marine in Quantico for Vietnam! Do you think the FBI can find any theologians or priests/ministers who started out life as a Marine Sniper in the Vietnam era? How many people can that be? Going back to the Manassas killing, it pointed right to Massaponax says Sollog since MASSA can be spelled within Manassas. MASSA was the 7th son of Ishmael. Seven biblical figures had the name Manassas the location struck before Massa. See how clever the sniper is. So he put the number seven out there twice biblically. Where did he hit next. Falls Church, on Rt. 7 in the 7 Points Shopping Center! Do you think anyone in the FBI has the theological background to figure all of this stuff out? NO! Sollog even explains the killing on the border of DC that occurred on Kalmia Ave. Kalmia is a poisonous evergreen bush, its nickname is LAMB KILL. What is the sniper doing? Killing Lambs or INNOCENTS! Every single thing the sniper is doing is a clue to the police. IT IS ONE BIG GAME! And Sollog has cracked the code. He explains the sniper will strike at 5 more locations that all form a Pentagram. He also says the final sacrifice in the snipers mind is the heart of DC! 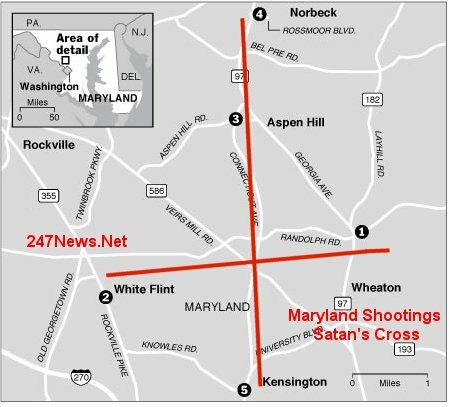 Here is the first five shootings that formed a satanic upside down cross.